There are different kinds of chess beauty. A combination with sacrifices is beautiful, as well as a deep positional plan. There is a paradoxical beauty, when the Gordian knot of seemingly unsolvable problems is suddenly split with an unexpected tactical blow or a fine and hidden maneuver. And there is a beauty of logic, when a chessplayer paints his victory, utilizing hardly noticeable inaccuracies of an opponent. The game that you are going to see, dear reader, fits exactly into the latter category. Is this a joke? Where is the commentary? The answer is simple – see theoretical books and articles. All those moves have occurred in chess practice dozens times. The endgame is not as drawn as it might seem at the first glance. Yes, Black has no weaknesses, but White stands more «elevated», not only in the center, but also on the kingside, which is very important. The h5-pawn fixes potential objects of attack on g7 and h6. There are not too many pieces left on board, but there are some, and the remaining pair of knights is an important factor in positions with a space advantage. My conclusion: White can play for a win, and the practice shows that it is achievable. 21.f3. This prophylactic move is a prelude to a long maneuvering aimed at accumulating on small advantages. 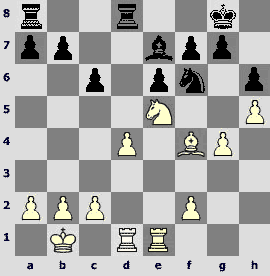 In other games White played 21.c3, 21.¦d3 and instant 21.c4. 21...Ґd6. Black also waits. Of course, 21...c5 is possible (Lutz – Khenkin, Bundesliga 2002), but White's pawn advantage on the queenside in the resulting position will be a serious advantage. Kramnik against Shirov (Russia – World rapid match, 2002) and Topalov against Akopian (Wijk aan Zee 2004) played 21...¦ac8 followed by с6-с5, but did not equalize, too. One could try exchanging knights – 21...¤d7 – White should decline this exchange by 22.¤c4 (Ginzburg-An.Bykhovsky-junior, Ashdod 2003). Dreev's idea to play 21...a5 and reply to 22.c4 with 22...¤d7 is interesting; however, I would think about 22.a4. The text move creates a threat of 22...¤d7 with simplifications. 22.Ґe3. White wants to block the с6-с5 break. 22...¦ac8 23.c4 a6. Vishy Anand played 23...a5 in a famous game against Kasparov (Linares 2003), but it turned out that the endgame after 24.a4 ¤d7 25.Ґd2 Ґc7 26.Ґc3 ¤xe5 27.dxe5 c5?! 28.ўc2 ¦xd1 29.ўxd1 ¦d8+ 30.ўe2 ¦d7 31.f4, followed by ¦а1-а3-b3, is far from being drawn. Premature is 23...b5, as White turns to attacking the c6-pawn: 24.¦c1 a6 25.Ґf2 ўf8 26.¦e2 ¦c7 27.Ґg3 bxc4 28.¦xc4 ¤d5 29.¦a4 ¦b7 30.¦c2± (Drabke – Heinig, Seefeld 2003). On 23...¤d7 it makes sense to avoid exchanging of knights by 24.¤d3. 24.Ґf2 ўf8 25.ўc2 b5. One can play this, because white king has interposed the c-file. 26.b3 Ґe7. Black prepares с6-c5. 26...Ґb4 did not work in view of 27.¦e2 bxc4 28.bxc4 c5?! 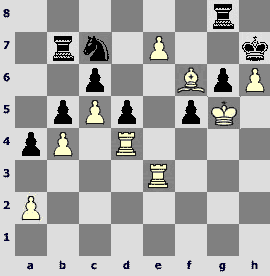 29.¤d3 cxd4 30.¤xb4 ¦xc4+ 31.ўb3 ¦c3+ 32.ўa4 ¦xf3 33.Ґxd4 with clear advantage. 27...¤e8. Now Black decides against 27...bxc4 28.bxc4 c5, because after 29.dxc5 ¦xd3 30.ўxd3 (30.¤xd3?! 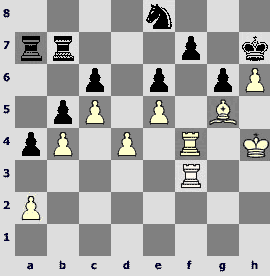 ¤d7) 30...Ґxc5 31.Ґxc5+ ¦xc5 32.ўd4 ¦c7 33.¦b1 he would struggle stopping the c-pawn. There is a dilemma of worse positions – passive or active defense. Groundless activity only creates additional weaknesses. Passive defense may lead to a slow smothered death, and not many players can stand such a torture psychologically. One has to master both methods. By the way, while the specialists in a counter-attack (like Viktor Korchnoi) are recognized and admired by the chess community, the experts in a passive defense, such as Ratmir Kholmov and – in recent years – Bartlomiej Macieja – only provoke a skeptical reaction: «what a lucky guy!» Such an attitude is wrong! The ability to create maximum difficulties with converting an advantage for the opponent is just as important as the ability to conduct brilliant attacks. Konstantin Sakaev decided to defend passively. Only a deep intuition could tell Black whether or not his defense is breakable. It seems the intuition has misguided the experienced grandmaster this time. 28.f4 ¤d6 29.¦f3. Too early is 29.c5 ¤e8 followed by ¤f6. 29...Ґf6?! The last chance to create a counterplay was 29...bxc4 30.bxc4 Ґf6. After 31.¦d3! с5! (bad is 31...Ґxe5 32.dxe5 ¤xc4 in view of 33.¦e4 ¦xd3 34.ўxd3 ¤a5 35.¦a4) 32.dxc5 Ґxe5 33.¦xe5 ¤xc4 34.¦e4 ¤a5 35.¦b4 White keeps a certain edge in the endgame, but Black should not lose with precise play, thanks to some good central outposts for his knight. 30.c5 ¤e8 31.g5! Ґxe5. Black loses after 31...hxg5 32.fxg5 Ґxe5 33.dxe5 (with idea g5-g6 or h5-h6), as well as in case of 31...Ґe7 32.f5! 32.fxe5. 32.dxe5 (with idea f4-f5) did not work out well for White: 32...¦d5 33.f5 exf5 34.gxh6 gxh6 35.Ґe3 ўg7 (otherwise after a loss of the h6-pawn the passer h5 becomes very scary) 36.¦g1+ ўh7 37.¦xf5 ¦c7, and Black holds. After the text Black is doomed to the eternal passive defense. But can White break the fortress? 32...hxg5 33.¦g1 ¦d7 34.¦xg5 ўg8. So, black knight must defend the g7 without even dreaming of a nice d5-square. What next? 37...g6. It turns out that the pawn on h6 is taboo: 37...ўxh6 38.¦h3 ўh7 39.Ґe7+ ўg8 40.¦gh4 f5 41.exf6 ўf7 (41...gxf6 42.Ґxf6!) 42.fxg7 ¤xg7 43.Ґd6 ¦g8 44.¦h7 ўg6 45.Ґe5 with a decisive attack, or 37...gxh6 38.¦fg3 (with idea ¦g8 and Ґf6) 38...f5 (the only defense) 39.exf6 ¦f7 40.¦g8 ¦d8 41.¦g1, and after some more pawn moves – 41...b4 42.¦1g2 h5 43.¦g1 – Black appears in Zugzwang and has to let white king breaking into his camp, and then via f4 to e5. For example: 43...¦c8 44.ўd3 ¦d8 45.ўе3 (Zugzwang again!) 45...¦b8! 46.ўf4 ¤xf6! (the last chance!) 47.¦xb8 ¤d7+ 48.ўe4 ¤xb8 49.ўe5 ¤a6 50.ўd6 (worse is 50.ўxe6 ¦f4 51.Ґf6 ¤c7+) 50...¦f4! 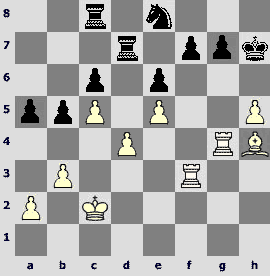 51.¦h1 ¦xd4+ 52.ўxc6 ¦d2 53.ўb6 ¤xc5 54.ўxc5 ¦xa2 55.ўb5 ¦a3 56.¦b1 and White is winning. Thus one has to decline the sacrifice. So what? A fortress is still unbreakable, isn't it? с) there is another plan: 45.ўe3 ¦a7 46.ўe4 ¦ac7 47.¦f1! (the same Zugzwang) 47...¦a7 48.h7+! ўh8 49.d5! cxd5+ (one can/t take on d5 with the rook, of course, and after 49...exd5+ White plays 50.ўd3, threatening 51.e6 – 50...¤g7 51.¦h4 ¤h5 – the only move – 52.¦f6! ¦ac7 53.¦xh5! gxh5 54.¦h6 f5 55.Ґf6+ ¦g7 56.e6 ¦ce7 57.¦xh5 f4 58.¦h6ќ) 50.ўd4 ¦ac7 (50...¤g7 51.c6! ¦dc7 52.ўc5 ¦a6 53.¦xf7 ¦cxc6+ 54.ўxb5 ¦cb6+ 55.ўc5 ¦c6+ 56.ўd4ќ) 51.c6! ¦xc6 52.¦xf7 ¦xf7 53.¦xf7, for example, 53...¦c8 54.¦e7 ¦c4+ 55.ўd3 ¦c8 56.Ґh4! ¦b8 57.ўd4 ¦c8 58.Ґf6+ ¤xf6 59.exf6 ¦f8 60.ўe5ќ. Does this analysis exhaust all the opportunities in this position? And what do you think, dear reader? Let's return to the game. 44.ўg3. Before undertaking a pawn break White improves his king's position. The reason for this maneuver will become clear in 8 moves! c3) 47...ўg8 48.¦4f3 ¦ac7 49.a3 (Zugzwang again!) 49...d4! (other moves are worse: 49...ўh7 50.c6; 49...¦c6 50.h7+ ўxh7 51.¦xf7+ ¦xf7 52.¦xf7+ ўg8 53.¦b7ќ; 49...¦a7 50.c6 ¦dc7 51.Ґe3 ¦a6 52.h7+ ўxh7 53.¦xf7+ ¦xf7 54.¦xf7+ ўg8 55.¦e7 ¤g7 56.ўg5ќ) 50.¦d3 ¦d5 51.ўg4 and with the help of his king White has to win this game. 46.d5! (finally!) 46...exd5. 46...cxd5 would lead to the positions that were analyzed above. 47.e6 f5. This is what Black aimed at when playing 45...¦cb7. 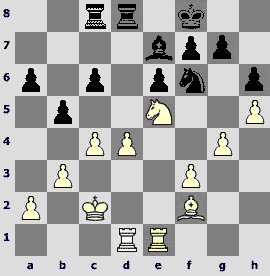 However, it is hopeless to fight against two passed pawns ("e" and "h"). Of course, 47...fxe6 loses immediately 48.¦f8 ¦a8 49.¦3f7+ ¦xf7 50.¦xf7+ ўh8 51.Ґf4ќ. 48.¦e3 ¦a8 49.¦d4 ўg8 50.e7 ¤c7. 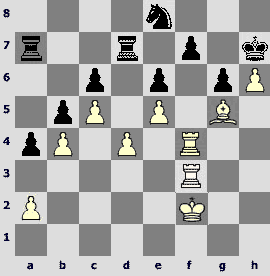 White threatened 51.¦e6, and on 50...ўf7 White wins by 51.h7 ўg7 52.¦e6 ¦c8 53.Ґh6+ ўxh7 54.ўg5ќ. 51.Ґf6 ўh7 (51...¤e8 52.h7+! ўxh7 53.ўg5ќ) 52.ўg5. This is why the king came to h4! 53.Ґg7 ¦a7. On 53...¤e8, White can play not only 54.Ґf8, but also 54.¦e6! 54.ўf6 ¦aa8 55.ўf7 ¤e8. Passive defense also did not help, as White would get the g6-pawn: 55...¦ac8 56.¦g3 ¦ce8 57.a3 ¤a6 58.¦d1 ¤c7 59.¦e1 d4 60.¦xg6 d3 61.¦xc6 ¤d5 62.¦ce6ќ. The «active» 55...g5 is refuted by 56.¦e5 ¤e8 57.¦xf5 ¤xg7 58.¦xg5ќ. 56.¦e6! ¤xg7 (56...g5 57.¦xc6 ¤xg7 58.¦g6ќ) 57.¦xg6 ¤h5 58.¦xg8 ¦xg8 59.e8Ј ¦xe8 60.ўxe8. The rest is easy. 60...f4 61.ўd7 f3 62.ўxc6 f2 63.¦d1 ¤f6 64.¦f1 ¤g4 65.ўxb5. An impressive journey of the king!